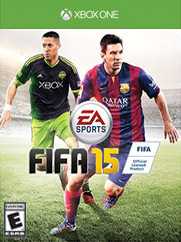 Game Description: FIFA 15 brings football to life in stunning detail so fans can experience the emotion of the sport like never before. Witness the intensity of crowds chanting and cheering like on match day, and listen to commentators guide fans through the story of the game with Dynamic Match Presentation. For the first time ever, all 22 players on the pitch are connected with Emotional Intelligence – now players will react to opponents and teammates within the context, and relative to the narrative of the match. Authentic Player Visuals make players lean, athletic, and true to their real-life appearance. Player Control heightens the responsiveness of player movement, gives athletes more control and personality on the ball, and makes Man-to-Man Battles more rewarding than ever before.